Samsung has finally dropped the line on the Galaxy S III sending out official invites for a Samsung Mobile unpacked event in London on May 3rd. 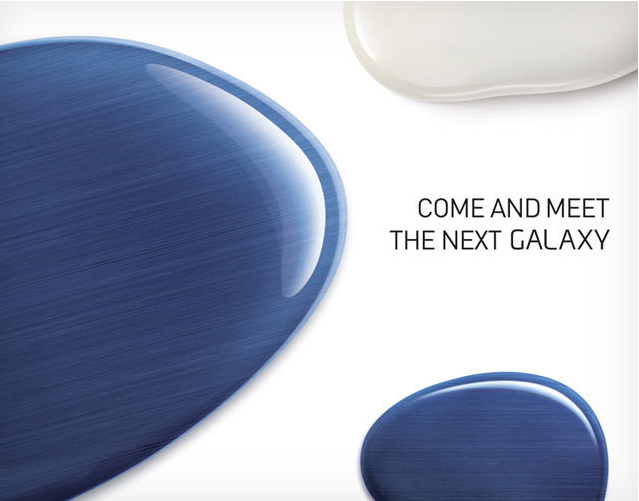 That’s the official word now as a number of websites around the world report receiving the invitation that says simply “Come and Meet the Next Galaxy.” Samsung plans to live stream the event which begins at 7pm local time (2pm EDT, 11am PDT) via its official Facebook page. With an official event on the books will that put a stop to the fake renders floating around? That’s unlikely but at least we know in a little more than two weeks we’ll finally have all the official specs on Samsung’s next flagship device. More importantly we hope Samsung announces both US carrier availability and a launch date, for a device they’ve stated they want to launch at the same time globally. Im definately gonna be scooping one up! Been using a Sony Ericsson T-610 for the past 6 months or so since my iphone broke. The wait for a SGS3 is over! People have high expectations for this device. It will be good to finally get some real specs on this baby. The UMTS version of the Galaxy Nexus is pentaband, so I don’t think it’s really *that* unlikely that the GS3 might be. Made to be that way at the hands of somebody else’s whims though, not Samsung’s. Exactly, and don’t forget the international gs & gs2 are a bit different than the t-mobile version. That always being the case I would expect t-blowbile will get their leftovers after all the big boys have filled up. So I wouldn’t get all excited about what they announce in London we’re talking apples & oranges gentlemen. We probably won’t get an official t-mob announcement until july or august. Tmo had the GS and now the GS2 which has been a great seller…therefore there is no reason why they won’t have a Tmo GS3. Either way Tmo will get it srt8 up w/ HSPA+ 42 or a penta-band version. Yes but you miss the point. My beloved SII had an unfortunate, freak, fatal accident yesterday, so hopefully it’s not too long until launch day. I wanna see if the one that will come to T mobile will be any different from Sprint or AT&T version since T mobile doesnt have LTE. To wait for the new Galaxy or the HTC One S. WHATTODO!? Definitely u should w8 and compare b4 u take the plunge…i will be waiting for sure cuz my gut feeling is Sammy is aiming for world wide launch US carriers included. Now if the rumors are true that the One X will be coming to Tmo w/ vanilla ICS that might pose a problem. For me it is a dog fight between a vanilla One X on Tmo and the GS3 on Tmo. The GS3 has the edge cuz it will most likely have an SD card slot and a bigger removable battery. The vibrant taught me to wait and see. I’m not even going to be bias or pro htc. I want to wait on that 1s as well, especially if the 1x might be a possibility. Then by mid july I’m off contract anyway and have much more than the device to consider. It its that blue color I’m sold! This blue shape is really annoying with its pattern looking like my sg2s washed out display. Any one els have that problem on there s2 were theres lines and some spotts on some dark screen pages or between switching from a bright screen to black? I freaking ? my S2! I came from the HTC Sensation 4G & it was defiantly a worthy upgrade! I can’t wait for the S3! It’s gonna kick azz & no thanks regarding the 4.3inch screen on the HTC One S! People signing up with tmobile be aware!!! Reps who works at tmobile, are giving wrong information on phones and plan and rebates! I had signed up with their service and was awaiting rebate and it was denied because rep gave me wrong info. Customer service is unwilling to do anything regarding this@@ I’m stuck with their phone and plan and paid for what suppose to be a free phone!!!! They did the same thing to me. The sales rep offered me a free phone to extend my contract and said it would be mailed to me. I never received the phone and called the customer loyalty department and was told by a rude rep that there was no way they offered me a free phone and they couldn’t do anything for me. I then proceeded to play the call that I recorded with the sales rep and she hung up on me. After numerous calls I said that’s fine I just want out of my contract because I was lied to. They obviously didn’t and now I’m stuck with a 2 year contract and an old phone. I really don’t know if this is true or even credible …cnet crave UK is saying that sg3 won’t be called sg3 instead it will be just an minor upgrade from the sg2…!!! Will Tmobile USA get the SGS3? If so when? Come and DISCOVER and new Galaxy! DISCOVER! God who does the marketing for these folks?! ?